The thing about using vintage dishes and silver is that one becomes rapidly aware of the particularities and peculiar functions of the individual pieces. I don’t know that I ever really considered the existence of fruit bowls before this endeavor began. Once again, this forms an odd intersection with the process of registering for my own china; I think that I’m going to skip the fruit bowls. Much as I like fruit, I think I can make do. Or I could just go buy a couple dozen for fifty cents each. Yesterday, after pounding at my keyboard all morning and sending off some writing, I took my thrift store wandering—flanerie? in a Prius?—a bit further out of my usual in-town circuit. For whatever reason, Madison is thick with thrift stores—and they’re generally really good. I don’t quite understand it. You’d think that the fact that everyone here seems to want blue mason jars and milk glass would mean that such things would be scarce, but they’re everywhere. Usually, I ignore the bins of flatware in thrift stores. 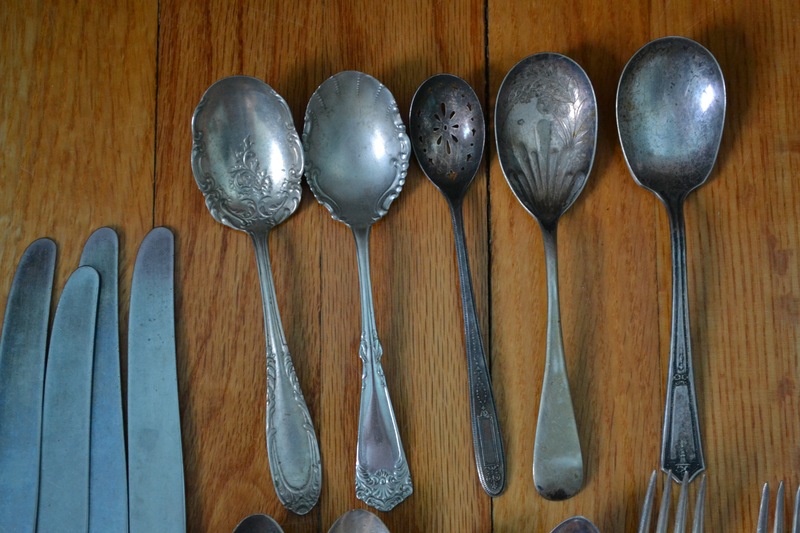 It mostly seems to be cheap, sharp spoons that were stolen from dining halls or Old Country Buffet. Yesterday, though, a silver-plate pie server caught my eye. I started digging, and came up with 61 pieces of silver-plate. 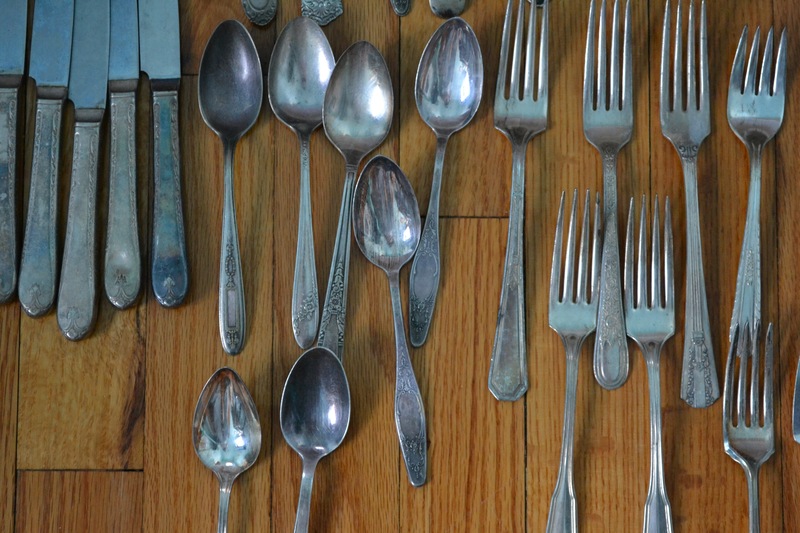 A lot of it is odd—sugar shells, berry spoons, cold meat forks, butter knives. 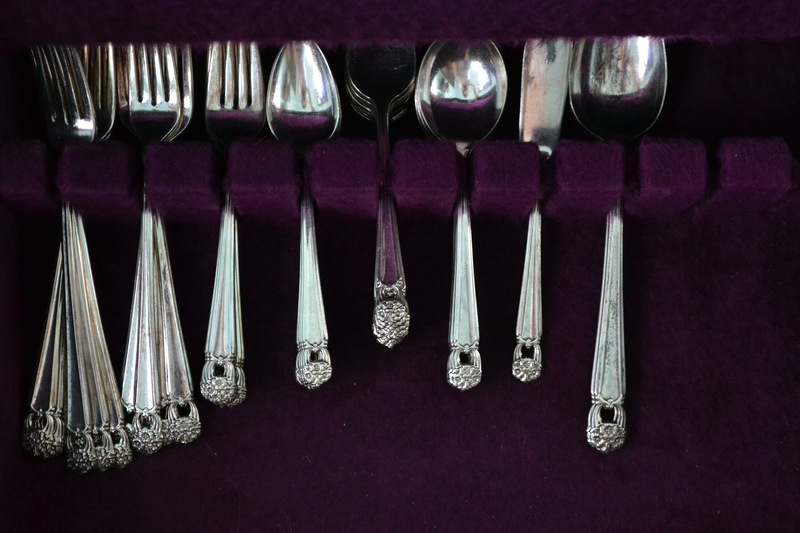 The teaspoons and forks will be making an appearance at the wedding tea, which led me to my contemplation of the proper use of silver. Can one eat cake with a dinner fork? Well, one certainly can—but should one? The thought would have probably shocked my grandmother, whose impossibly varied set of Tiffany silver winks at me from beneath blue felt wrappers. The proper occasion for her tiny, three-pronged forks has never arisen in our house, though I suppose it has something to do with the fact that they are probably meant to pry some unwilling creature from a shell, and tofu seldom fights back. Silver-plate is an odd thing. Is it trash, or is it treasure? As I was piling my finds on the counter to pay for them—twenty-five cents a piece—an odd little man with a jeweler’s loupe started to dig through them, studying the hallmarks and tossing them down again. The scale of my wedding-related thrift purchases—ten teacups at a time, twenty dessert plates—tends to raise some interest among that kind of person. You can feel the anxiety rising around you as he peers suspiciously into your cart full of teacups, convinced that you’re on to something great. If you step away for a moment, he reaches in the cart and shifts the plates, looking for maker’s marks. While I have come across bits of Wedgwood, Limoges, and sterling in my thrift shop scavenging, it’s mostly—from the reseller’s point of view—pretty unremarkable. But it’s funny what you’ll find. A few weeks ago, I lifted the lid of a pretty unremarkable looking box and found an impressively large set of “Eternally Yours”—my other grandmother’s pattern. It even has the cold meat forks. i love this sentence: The proper occasion for her tiny, three-pronged forks has never arisen in our house, though I suppose it has something to do with the fact that they are probably meant to pry some unwilling creature from a shell, and tofu seldom fights back. It’s a bit of a run-on, isn’t it. Sometimes, I like run-ons.